The University Archives collects the personal and professional papers of senior administrators, long-term faculty, selected alumni, and others whose primary institutional affiliation has been with the University of Minnesota. Generally, these collections complement departmental holdings and reflect the teaching, research, and service missions of the University of Minnesota by capturing the personal perspectives of those tasked with implementing theses missions. Unfortunately, these collections are not always robust. They have been unceremoniously weeded by their creators during office moves or retirement, picked over by colleagues and family after a person’s passing, or stored in multiple locations hindering attempts to reconcile the documents. These are generally the conditions archives consider normal. The personal papers of individuals that we do collect are done so with an acknowledgment that it is usually an incomplete set and likely the best means to document their work. Lately, however, a new approach to digging deeper into the professional lives of those individuals that make up the university has become evident. As the University Archives digitizes portions of its holdings, there is now the ability to keyword search across hundreds of thousands of pages of press releases, minutes, annual reports, and alumni and university newsletters in the University Digital Conservancy. Trolling through this much information simply would not have been possible before. One recent example that I came across was information about Ray M. Amberg, who administered the University Hospitals from the 1930s until his retirement in 1964. The Archives does have a small set of his papers, mostly consisting of personal correspondence and various accolades received for his performance. Yet, by searching the digital archives, a much richer depiction of his involvement with the university becomes clearer. The first mention of Mr. Amberg is as a student singled out in the 1918 President’s Report as one of eight students leaving their studies to take part in the war effort. As Director of the University Hospitals, the defining moment of his career was likely the opening of the Mayo Memorial Hospital in 1954. 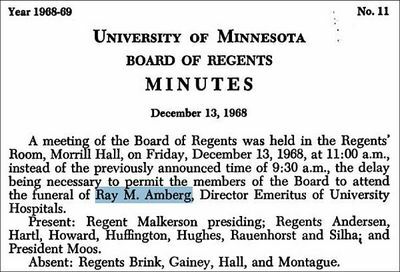 Finally, in December 1968, the Regents’ minutes note that their regularly scheduled start time was delayed so that they could attend the funeral service of Mr. Amberg. “Five students were hit by autos, six were bitten by squirrels on campus last year” are two highlights from a 1971 report from the Students’ Health Service. The Health Service opened in 1918 as a response to the need for student medical care on campus. 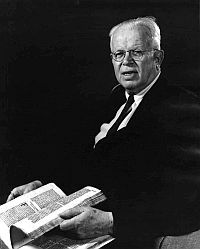 The first director was Dr. John Sundwall from 1918-1921. The next director was Dr. Harold S. Diehl who would lead the Students’ Health Service from 1921 until 1935 when he became dean of the College of Medical Sciences. The Health Service is most known for its third director, Dr. Ruth E. Boynton for whom the service was named in 1975. A 1924 report on the Students’ Health Service by then director Dr. Diehl highlights the rapid growth and use of the facilities in its first few years. At the time, the service had 25 beds as well as examination and laboratory space in the basement of Pillsbury Hall. The St. Paul campus had its own building devoted to the Health Service that had 40 beds and out-patient dispensary. 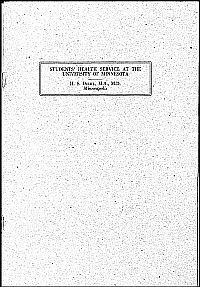 Read Dr. Diehl’s full report as reprinted in Minnesota Medicine in April of 1924.